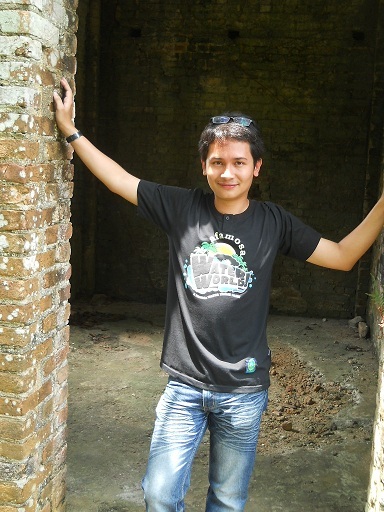 Eat, History, Love : Kellie’s Castle @ Batu Gajah, Taiping & Kuala Kangsar – All Perak Darul Ridzuan! Like I said, I am spontaneous. Spur of the moment things are more enticing and inviting compared to the scheduled ones. On Saturday 6th March 2013; after the soporific and tiring (due to my sore throat & scarce-of-voice) schedule of Extra Classes for Year 4, 5 and 6 at school, I pushed off to KL for the usual weekend rendezvous. BUT, an initiation by another party to venture Perak had caused spontaneous decision. We would be going to Perak to savour the weekend! 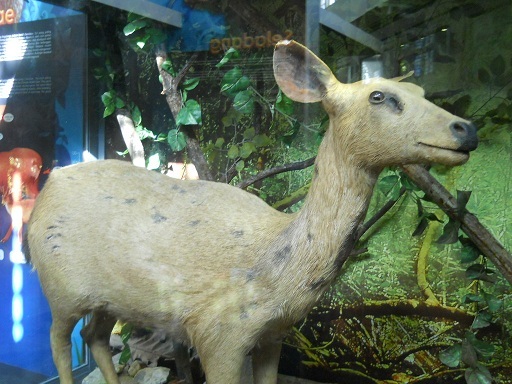 Perak Museum in Taiping, Perak. Kellie’s Castle in Batu Gajah, Perak. So, from KL (as I went there); we pushed off to Taiping, Perak around 3.30 p.m. The journey upnorth was a relaxing one albeit there were a lot of vehicles thronging along the PLUS highway! Arrived at Taiping circa 8.00 something, scouted the hotels. Seemed that affordable yet comfortable hotels like Legend Inns and Warisan were all occupied! 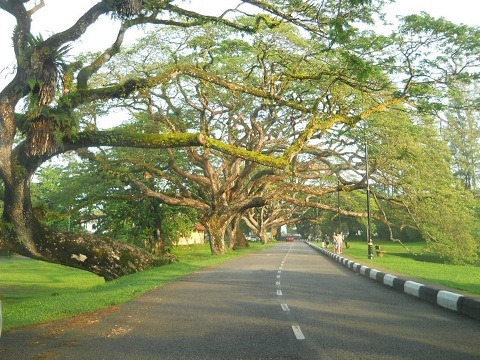 I wonder why people were thronging Taiping in the weekend. At last, we resorted to an old looking hotel called Meridian Hotel. It was ala 60s-70s Hong Kong building architectures; the similarities were uncanny to the hotels I resided in Beijing & Tianjin in China! The feeling of a haunted eerie hotel as per Stephen King’s horror “The Shining” was so thick! But, I was kinda enjoyed the mysterious feeling. Although the water and bathroom ain’t that nice, but the room was quite spacious. 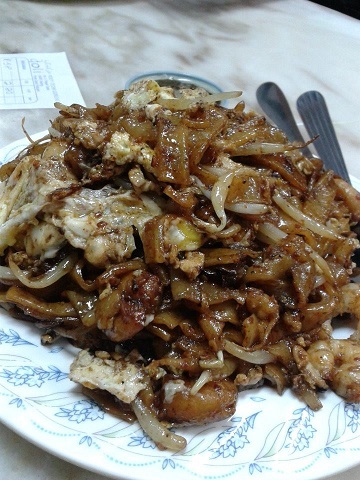 The sumptuous “Kuey Teow Special” at famous Doli Char Kuey Teow in Taiping. A must-go for Kuey Teow aficionado. Lotsa cockles and prawns! YUMMY! Then off for night roaming in Taiping. 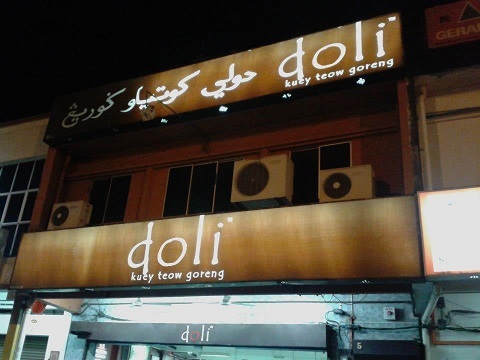 We scouted for the famous Doli Char Kuey Teow in Taiping as I’ve always hear about it. Although I am not a Char Kuey Teow aficionado, but I had almost finished up the “Special” Kuey Teow with its big cockles and prawns! Yummy!!! Since I am seafood aficionado, certainly I gobbled and savoured. I strongly recommended this for those Kuey Teow aficionados! The restaurant also is a far cry from the original road-side stall years ago. Now it is air-conditioned and all. 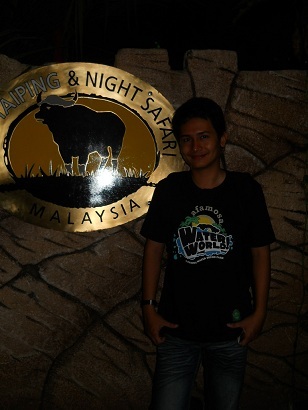 Taiping Night Safari. Well, it was dark. That is why the pitch-black. 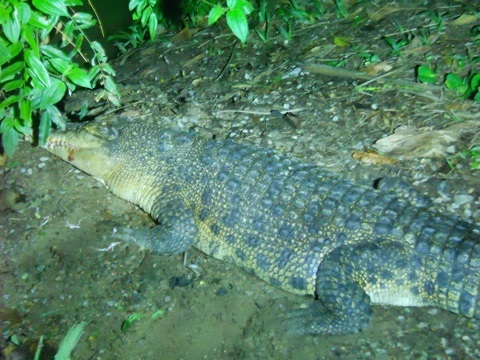 Next, went to the Taiping Night Safari as I was so curious with the concept. 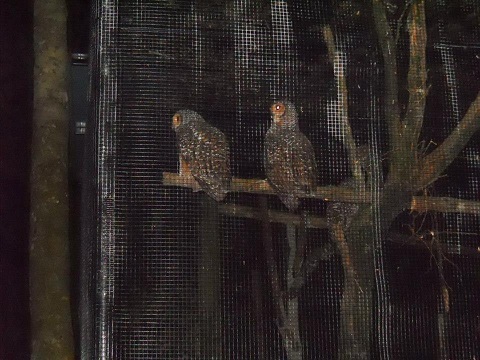 Basically it was just visiting Taiping Zoo during night time. Everything was dark and we boarded tram. Still, the element of “safari” can be felt although I have to confess nothing much. A new experience, nevertheless. RM 16 per per entrance. We called the night off after that. 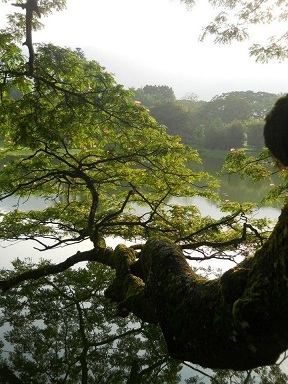 The peaceful Taiping Lake Garden! Subhanallah! So green. Love it! Well, it is the wettest spot in Malaysia, anyway. The next morning, Sunday; we began the day as early as 7.30 p.m. The first destination is to Taiping Lake Garden. It is the hub for people to go relaxing and doing exercises. The atmosphere was so refreshing and tranquil. 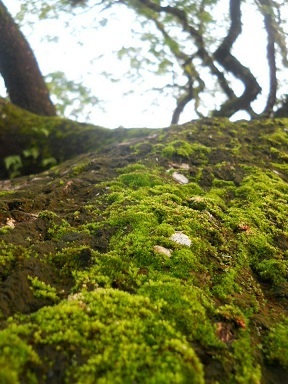 Seeing the lushes greenery, willowy trees touching the surface of the lake as well as the moss growing along the tree trunks add the feeling of au naturel ambiance. Subhanallah! Apart from that, we did roam around at the base of Bukit Larut or commonly known as Maxwell Hill. I could see there were a few sports recreational spot erected as well as some modern lodge-houses were built. Unfortunately, we didn’t have time to venture up there although initially, that was the plan. Never mind. One day, we will go up there! 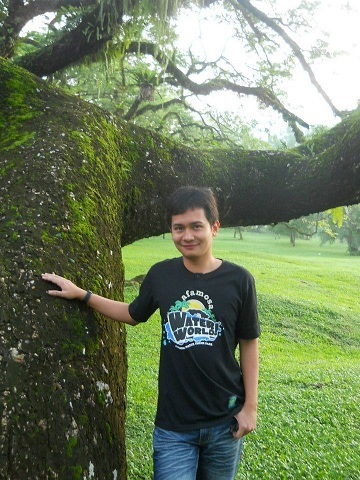 Since Maxwell Hill is situated in one of the wettest place in Malaysia which is Taiping, the atmosphere was so cool and “green”. Oh, my! I really love the feel. On the way there, lies the War Cemetery, which honoured those who were killed during the Pacific War against Japanese. Somber yet the very serene. Pacific War Cemetery. 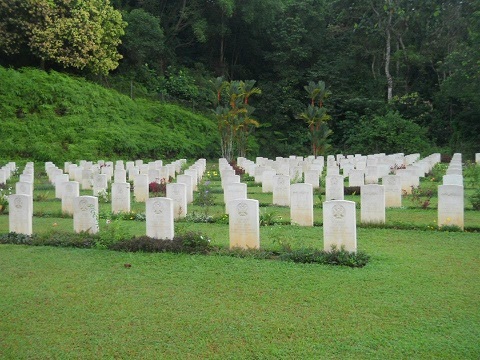 The tombs of the soldiers died during war against Japanese. As a historical freak, museum is my sanctuary. 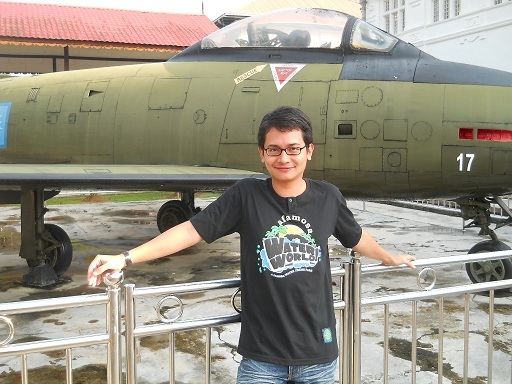 So, I dropped by at Perak Museum in Taiping. It was not that big but overall, an informative place. 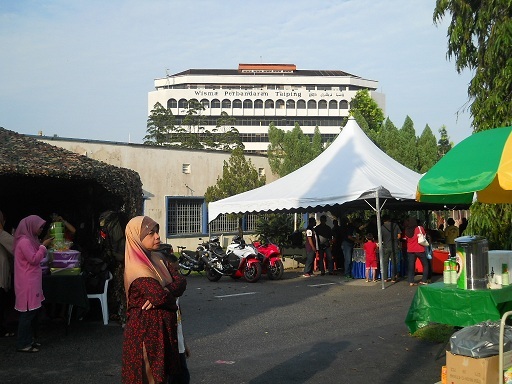 At a nearby Taiping Esplanade, there was an event called “Military Community Volunteer Day” – which was said to be a nationwide event conducted by Ministry of Defense to bond relationships with society. Since another party works closely affiliated with Ministry of Defense, armies and soldiers; we just dropped by and have a look at the event. It was still early and not many people just yet. Aerobic music; and soldiers preparing to march and tents of foods were erected. 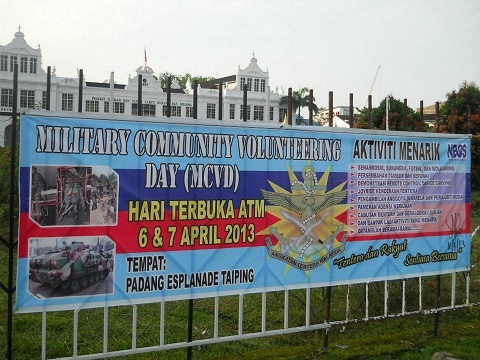 The Malaysian Military Community Volunteering Day at Taiping Esplanade. What a coincident! Then, around 9.30 p.m., we pushed off to Kuala Kangsar. Luckily we made to Kuala Kangsar around 10.30 p.m. Vehicles were thronging the little town and it was so hard to find parking lot! 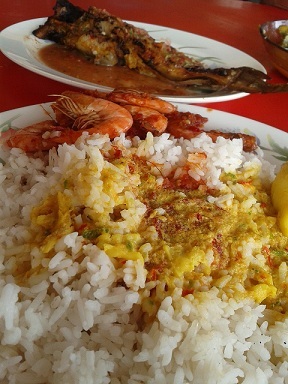 Anyway, managed to park at a roadside and then went to the Perak River Riverfront food arcade; feeling rather ravenous to devour the delicious roasted catfish (“ikan keli”) as well as the delicious Laksa Kuala Kangsar! 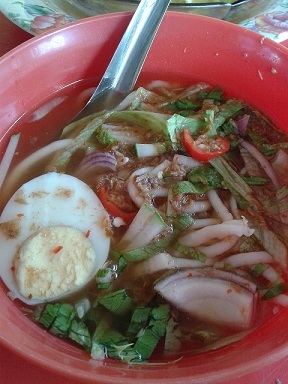 My stomach was so full and bloated and I even bought “takeaway” for the Laksa Kuala Kangsar! All in the name of fanatic fan of Laksa! Visiting Kuala Kangsar just for the sake of these foods! Yummy! 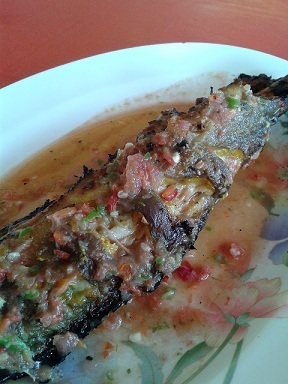 The delicious roasted catfish and Laksa in Kuala Kangsar! 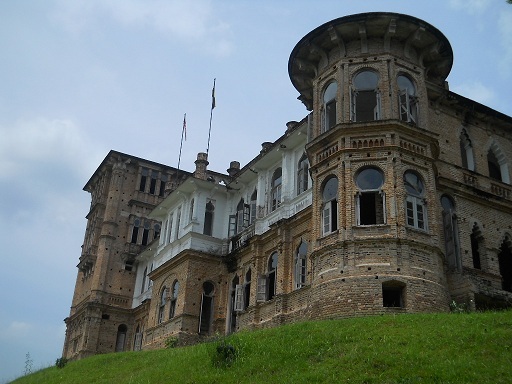 The last destination in Perak to visit within this limited time was the magnificent Kellie’s Castle near Batu Gajah, Perak. I remembered that when I was in primary school, I had this Malay storybook called “Bunian di Istana Kellie” (Elves In Kellie’s Castle”). It was a fabricated story of a pupil who befriended with a little elf who dwell in the castle and followed the boy back home. Kinda eerie that time. 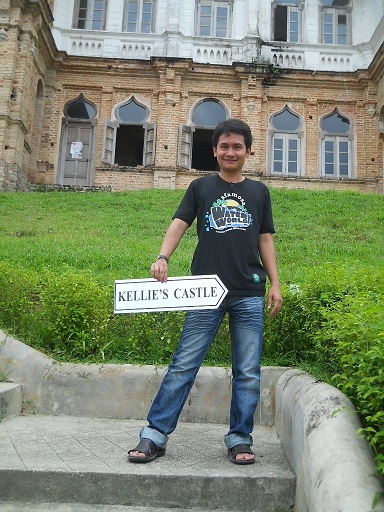 But truthfully, Kellie’s Castle is very enchanting for me; perhaps because I am historical freaks. So I have this “thing” with remnants and ruins. 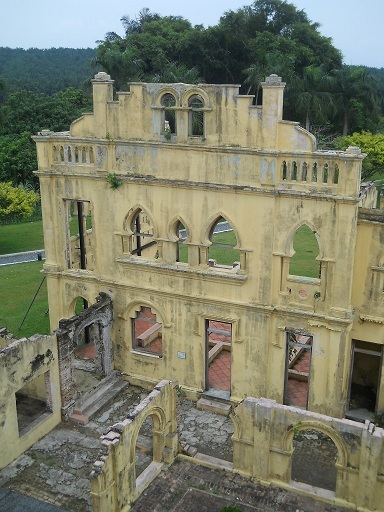 Kellie’s Castle in Batu Gajah, Perak. Magnificent Colonial remnant. It was majestic, indeed. 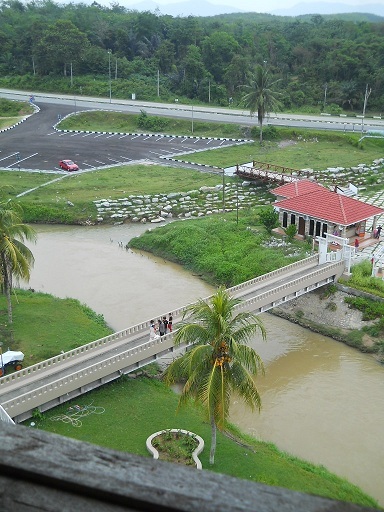 There was a little bridge built across the Kinta River to transport tourist to the small islet where the supposed ‘castle’ was built. 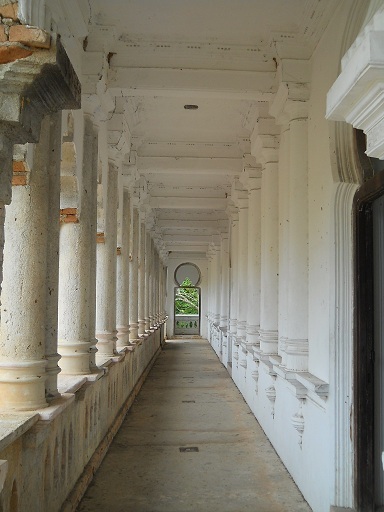 You felt as if you are being transported back to the Colonial Era. The remnants were huge and I was so mesmerized with the secret passageways and supposed-elevator that were built within Kellie’s Castle! It enthralled me to know that the tycoons of the yesteryears had given thoroughly thoughts on everything to evacuate their homes IF the houses were ambushed/attacked by terrorists! Secret staircases and underground alleys were common! The feeling of Hogwarts was eminent! Remnants of the first house, Kellas House. A secret passageway from the room. I went down to the secluded place. It was cool and a bit eerie. But I kinda like it. 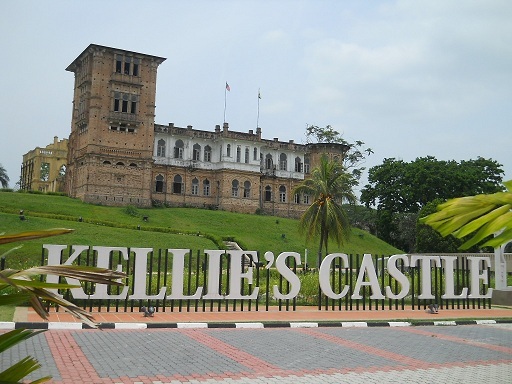 Now, according to the history, the castle was built by a Scottish named William Kellie Smith who worked in Malaya (Malaysia in the early 20th century). As a Civil Engineer, he came all the way from Scotland operating the mines industry there. 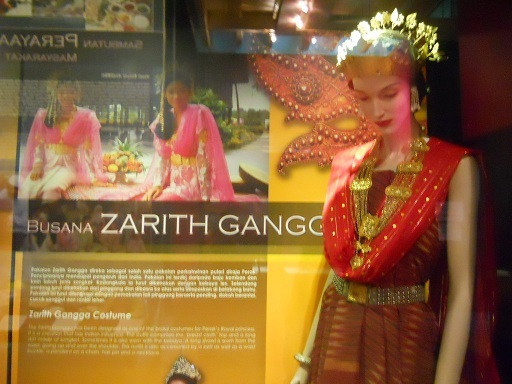 Got rich and married his sweetheart, Agnes and brought her back to Malaya. They had a daughter and a son. The first house was “Kellas House” – a name inspired by the birthplace of Willian Kellie Smith which was Kellas, Moray Firth in Scotland. He then decided to build a greater mansion/castle by the name of “Kellie’s Castle” but the supposed behemoth was unfinished due to the death of William Kellie Smith because of pneumonia when he was in Lisbon, Portugal in 1826. 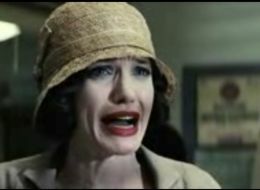 It was said the wife, Agnes were sad and fled back to Scotland leaving the castle unfinished. 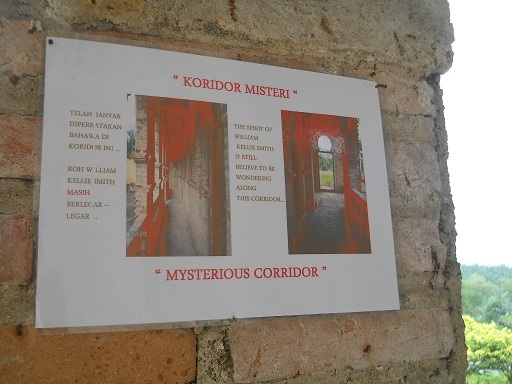 The supposed haunted corridor/path in Kellie’s Castle! I could still see a few workers taking care of the Castle. It was said that they are the descendants of the Tamil workmen brought by Smith to build the Scottish, Moorish and Indian-inspired mansion. According to urban legends, there were a few supernatural “sights” spotted. 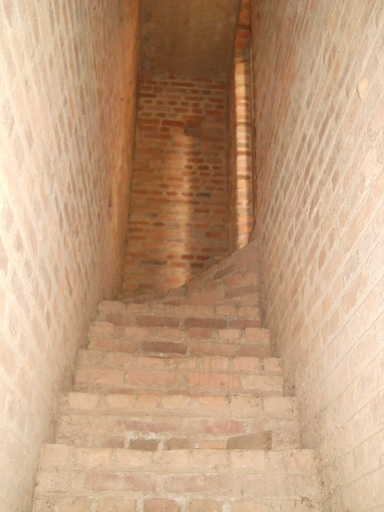 It was said that the spirit of Smith, the owner of Kellie’s Castle is still lingering around the pathway. If I was not mistaken, a local version of “Ghostbuster” crew named “Uncle Seeker” had even made some ‘supernatural contact’ in the castle. Oh, well. Either way, the remnant can be said as one of a unique masterpieces from the Colonial Era. 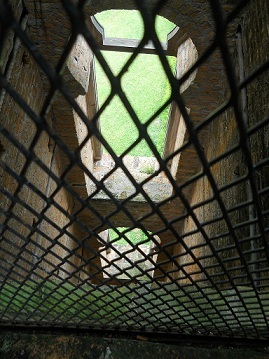 The supposed elevator in the castle. It was supposed to be the first one of its kind ever constructed in Malaya. But never crystallized. From the roof. YES, you can climb up there. From the bird’s eye view. 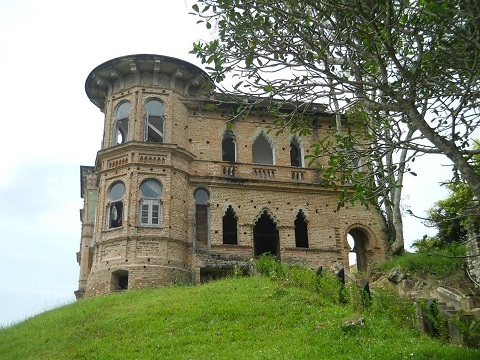 Kellie’s Castle. So majestic, isn’t it? Just ignore the full stomach due to roasted catfish and Laksa in Kuala Kangsar. Bloated and full! Hahaha! Fantasizing myself as a tourist. LOL! ← One Night Only! (Impulsive, Instinctive & Spontaneous) : Muzem’s Wedding @ Bota Kiri, Perak & Peninsular Malaysia Back-And-Fro! this is so amazing. You can be the ambassador for Cuti-cuti Malaysia! Beautiful! I didn’t know about it. I shall visit this when I come to Malaysia next month. Is is accessible from KL? Ave : wow really? Do come. Hm…quite far from KL… It is in Perak.